The world is a hard place. There is famine, war, disease, and all manners of things to make even the happiest person extremely depressed. But what if there were individuals who could do fantastical, impressive, and heroic things to make the world better. Well there is, and comic books are the place you can find them. 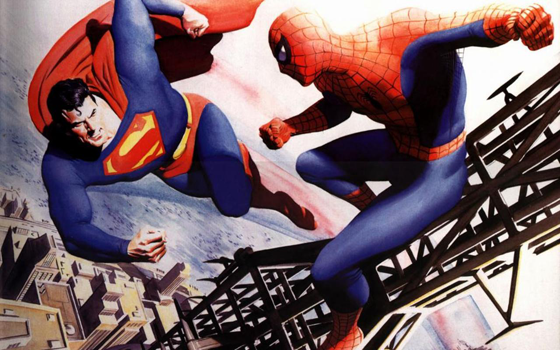 Comic books are the homes to some of the most recognized pop culture icons the world has seen. Batman, Wonder Woman, Spider-Man, Captain America, and probably the most popular, Superman. These are characters that many of us grew up reading about or listening to or watching on television. The adventures these heroes had helped us expand our imagination. They made us put red towels around our necks and pretend we could fly around the room. But most importantly, they helped us develop. When a child picks up a comic book, something amazing can occur. At an age when development is at its forefront, comic books can provide a lot for a child. For one, they can help with reading. Reading something that you’re interested in can help your focus. This is especially true for children. There are so many outside stimuli that can distract a child from reading, like television, video games, etc. If you hand a child something they want to read, they are more likely to sit and read it for an extended period of time. There are a lot of children out there reading at a lower grade level then they should be. If we can give children something to help them, and in some sense, an advantage later on, then shouldn’t we? Another advantage to children reading comic books is safety. Comics have long been a medium that pushed the limits of standards by tackling issues of the times. In Green Lantern #85-#86, September 1971, DC Comics tackled the risks and dangers of drug abuse when Green Arrow’s sidekick Speedy was caught injecting himself with heroin. This is an award-winning story that showed what happens when someone takes steps toward the wrong path. Several other characters in comics over the years have had to deal with abuse, alcohol, drugs, or otherwise. Comics do a great job of showing them why you shouldn't do these things, and how you can avoid them. They can also give safety in other ways, like keeping them from going off and causing mischief or committing crime, no matter how minor. Comics can help keep children out of situations they shouldn't be a part of in the first place. Children can also learn how to properly tell or plan a story. While this is not true of all comics, there are MANY that show how to greatly characterize, plan, storyboard, and progress a story. Comics can be a great way of developing writing skills, especially pacing and script writing. This can help them later in life, especially when they could be looking to get in to the writing business, film school, directing, etc. Pretending to be a superhero is a favorite childhood pastime. I fondly remember donning a red beach towel around my neck, running around in my underwear and blue t-shirt pretending to be Superman. I felt like I could do anything. That helped me develop confidence in myself, and helped me realize that I ultimately want to dedicate all my time to writing. Children feel that way every time they act like the heroes they read about and watch on television. Superheroes are a great influence. Maybe you want to fly like Superman. While humans can’t fly (yet), they can be pilots. Maybe you want to solve crimes like Batman. You can’t go out in a bat suit (or you can), but you could join the police force and try to help make the world a better place. Superheroes, in some ways, can help a child find their passion for something later on in life. Check back soon for the next entry into my new series, Why Super Heroes and Comic Books Matter!